Sid Meier's Pirates! - Buy and download the game here! In Pirates you take the leading role of a Pirate Captain in the 17th century Caribbean amassing fortune and fame in an attempt to seize your rightful place as one of the most revered and feared pirates in history. Test your skills as a sea captain exploring the high seas and exotic ports in a richly detailed 3D world. Overtake the enemy and seize valuable booty. Exchange plank-shattering broadsides in fierce naval battles, and engage in duels with worthy opposing captains. As your reputation and skills grow, so will the size and quality of your crew, and your ability to take on larger enemy ships, raid and plunder heavily fortified ports, and locate ancient treasure. There's a whole cast of interesting and dangerous characters to meet, mysteries to solve, exotic island destinations to discover, and powerful alliances to forge. The new Pirates carries on with the great gameplay and design simplicity tradition of the award-winning original while adding more challenging and exciting battle options, and deeper and more varied role-playing experience, including multiple paths to a wealthy, happy retirement. Experience an all-new story built upon the most fun and compelling features of the original Pirates! game. Live out multiple quests through a non-linear, open life timeline where every decision poses distinct challenges and possibilities. Witness the consequences of your actions in current events throughout the Pirates! world. Battle, overtake and command 27 different ship types, enhanced with assorted ammo, cannon and other upgrades. Take on various foes including merchant and military captains, ferocious pirates, evil gentry and even rival suitors - each with different skills and abilities. Confront enemies on board ships, in seedy taverns, on the ramparts and even at the Governor's mansion. Wield weapons - or anything within your reach - as you fence against foes. Engage in fierce naval battles fighting single enemies or multiple ships. Sneak into towns, escape out of prisons, navigate around adversaries and surprise unsuspecting vessels. Dispatch landing parties of buccaneers in strategic battles to take over entire cities. Increase your riches and impress the governor's daughter with your charm, fame, heroism - even your dancing abilities. Collect items (swords, spyglasses, armour, hats, coats, etc.) that improve skills or provide other new benefits and view them in a new inventory system. Enhance your gameplay experience with downloadable content including flags, sail emblems, character skins and more. © 2005 Take-Two Interactive Software and its subsidiaries. All rights reserved. 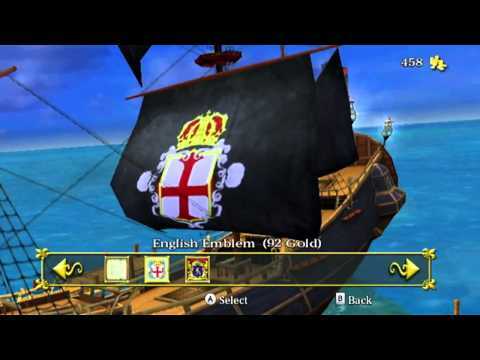 2K Games, the 2K Games logo, and Take-Two Interactive Software are all trademarks and/or registered trademarks of Take-Two Interactive Software, Inc. Sid Meier's Pirates! © 2005 Firaxis Games, Inc. All rights reserved. Pirates! is a U.S. registered trademark. Firaxis Games is a of Firaxis Games, Inc. The ratings icon is a trademark of the Entertainment Software Association. All other marks and trademarks are the property of their respective owners. All rights reserved.